Take Control of Your Website! 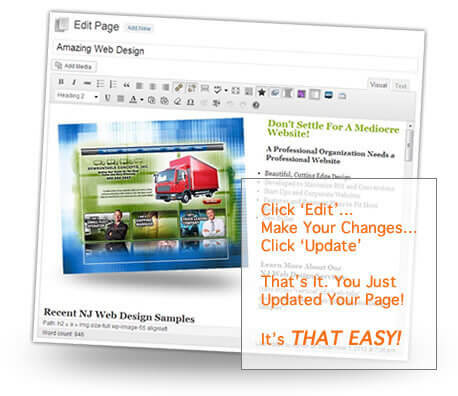 Update Your Site as Often as Needed and Reduce Maintenance Costs. CMS stands for “Content Management System”. Its a fancy term for software that lets you maintain and update your own website. Good Content Management Systems will enable the average office worker/word processor to make changes to a website with out having to know confusing coding like: HTML, PHP or ASP. The software works in a WYSIWYG (What You See Is What You Get) format that makes it very easy to use..
Why Do We Empower Our Web Clients? We have many web clients making use of our website service contracts and maintenance plans but we strongly believe in empowering businesses to maintain their own websites if they so chose. We have seen clients hold off on posting announcements to their website in an effort to curb maintenance costs. Unfortunately, by the time the updates are posted, the information is often no longer relevant or as important as it was a month prior. We would rather lose a few hours of billable updates if it means our clients can get the most out of their websites by doing the updates as they need them. We believe the more a client uses their website, the more value it holds for them. In turn, the more valuable the website, the more valuable we are to the client. We are all about the big picture and building mutual success with our clients. With CMS, you have the ability to add new content, change pricing, updates pictures, add web pages, and just about anything else you want to do with your website with out having to call for support. That means if you realize an hour before a big presentation that a date is wrong, you can change it on the spot. While Manna offers outstanding website maintenance services, we realize that many clients can not afford to hire someone to make every little website change. By investing a little more in the development of a website and taking the time to learn how to use CMS software, our clients can save money in the long-term on web updates. All of the CMS solutions offered by Manna Design have the ability to delegate portions or pages of a website to specific individuals or departments. This allows the workload of maintaining a website to be shared among those qualified to help. This also means each topic of a website can be maintained by the person responsible for that portion of the business directly. WordPress was designed to be the world’s easiest to use blogging platform. Because of the amazing flexibility in it’s core design, when programmed by an experienced web developer, WordPress can become an awesome Content Management System. Learn More About WordPress Here.